In today's diet debates, there is a lot of discussion around carbohydrates and dietary fats. Without understanding each macronutrient and its effect on your energy levels, it can be hard to choose the diet strategy that is best for you. In this blog, we will dive into the biochemistry of carbohydrates, dietary fat, and how your body converts them to energy! Carbohydrates get their name from their chemical makeup of carbon, hydrogen, and oxygen. This group of molecules is further classified into simple carbs and complex carbs. - Monosaccharides are made of 1 sugar. These are things like fructose (found in fruit), galactose (found in dairy), and glucose (main sugar building block, makes up blood sugar). - Disaccharides are made of 2 sugars. These are things like sucrose (table sugar; seen above) and maltose (found in beer). - Polysaccharides or Oligosaccharides are made of 3 or more sugars. These are grains, potatoes, corns, and vegetables. Dietary fats, known as lipids, are used to store energy, insulate tissues, and transport vitamins in the body. When discussing dietary fats, people generally break them down into saturated and unsaturated fats. - Consist of single bonds, resulting in a solid state. You generally find them in meats and solid oils like coconut oil. - Consist of at least one double bond, resulting a liquid at room temperature. You can them in olive oil and canola oil, as well as most nuts. What the heck does this mean for me?! Well, now that you understand the players, we can discuss the effect they have on you, your energy, and your health! Speaking of energy, it's important to note that the body's molecular form of energy is called ATP (adenosine triphosphate), as I will refer to it several times. Many simple carbs are found in sodas and syrups and according to the National Institute of Health (NIH), they are considered "empty calories" and can lead to weight gain. The "simplicity" of simple carbs allows for a very quick burst of energy and corresponding spikes in blood sugar. More complex carbs result in less spikes and more sustained energy. When your blood sugar has repeated spikes, your pancreas has to work extra hard by constantly releasing insulin in order to lower your blood sugar. Over time, high levels of insulin secretion results in insulin resistance and can eventually lead to Type II diabetes1. Not only is this prolonged insulin secretion unhealthy, but the metabolic process of glucose metabolism creates much less energy than the energy from fat metabolism! Wooahhh! While that looks complicated, the important thing to note is that this process only yields you a net 2 ATP molecules (remember... that's your body's energy)! The process has a prepatory phase that actually uses energy (2 ATP) and then a pay-off phase that creates energy (4 ATP) for a net of 2 ATP molecules. That being said, there are other byproducts (electron carriers like NADH and FADH2 that also get broken down resulting in an ultimate 30-32 ATP from a single glucose2. 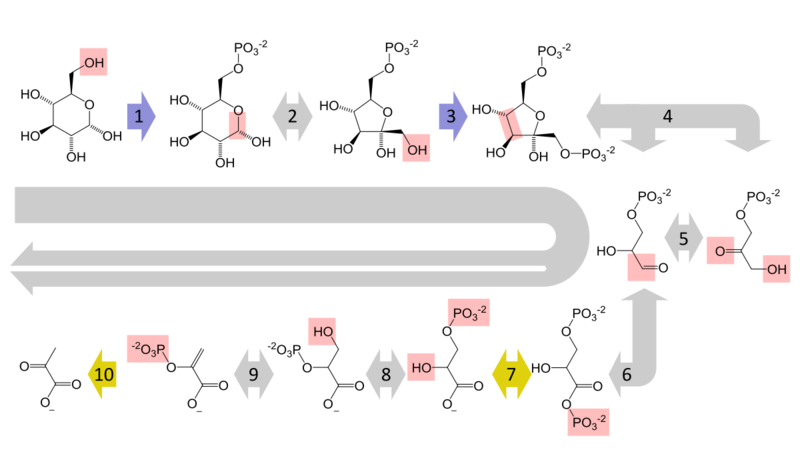 Just in case you are a nerd like me, you can learn more about the other steps through either of these links (Krebs Cycle, Oxidative Phosphorylation). 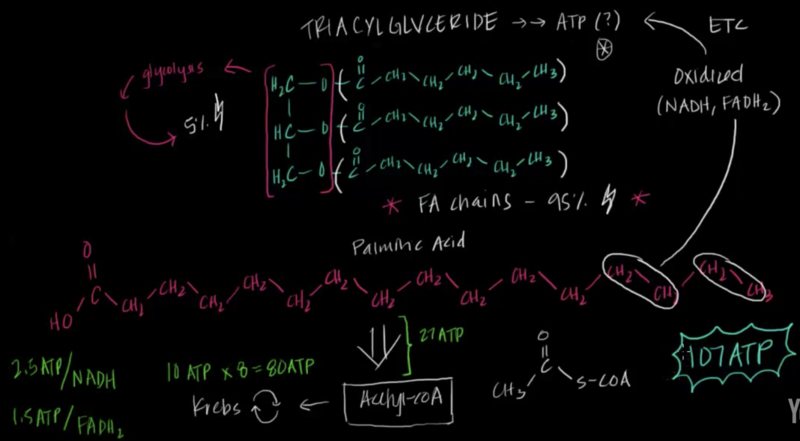 Since 30 ATP molecules means nothing to anyone but biochemists, let me compare this to fat metablolism. Fat metabolism, also known as fatty acid metabolism, is a bit more complicated because its starting material is generally much larger and more complicated than sugars. Let's start with a fatty acid that is found in lots of food types, palmitic acid. This fatty acid is found in meats, cheeses, butter, and dairy products3. The metabolism of this molecule creates enormous amounts of ATP through the breakdown of the fatty acid chain into a molecule called Acetyl-coA, generating 27 ATP + the amount of energy each Acetyl-coA generates when it enters the Krebs Cycle (mentioned above) which is 10 x 8 or 80 ATP for a total of 107 ATP from one palmitic acid! If you'd like to see a video depicting the breakdown, click here! But this is a screenshot showing an overview of where all that ATP came from! The amount of energy released from fat metabolism is exactly why your body likes to store its extra energy as fat and why it prefers to use the easy-to-breakdown carbohydrates when they're readily available. This is an important point because if sugar is available, your body would prefer to use it and leave these energy-rich stores for a rainy day. Think of it like this, let's imagine you have $20 of cash in your wallet, and $1000 in your bank account. You go to a store and purchase something that costs $15. Would you use the cash thats in your wallet or would you go to the bank to access your large money supply (... in a world without debit cards)? I know I would use that cash first! Now, let's imagine you only have $5 in cash and buy that same $15 item. You will need to go to the bank and take out extra cash! This is essentially how it works in your body, once you remove the carbs (cash in your wallet), your body taps into these energy rich fat stores (your bank account) resulting in fat reduction (cash withdrawal), and weight loss. Your body can very adequately and happily sustain itself from fat metabolism, and fat metabolism actually releases much more energy than sugar metabolism, and can lead to greater fat loss. If this is the case, why does most of America have a carb-centric diet? Well, I know one reason and you can read up on it here, but that's a conversation for another day. I hope you enjoyed your science lesson and understand a little more about what's going on when your body breaks down its macronutrients.